There Will Be Blood is the best film of 2007. 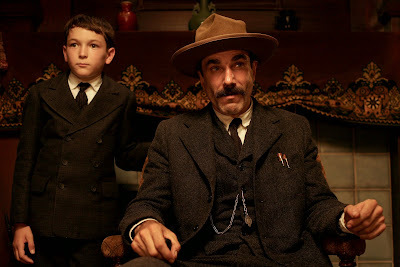 It is a character study focusing on Daniel Plainview, played by Daniel Day-Lewis in a performance that fiercely crystallizes the epic vision of the movie's director. Paul Thomas Anderson has given us some noteworthy films already, like Boogie Nights (1997), and Magnolia (1999). His films' ensemble casts inevitably led to comparisons with Robert Altman (M*A*S*H , Nashville ), another director known for working with large casts. And in fact, the reason we haven't seen a film from Anderson since 2003's Punch-Drunk Love is because he was serving as back-up director for Altman's last film A Prairie Home Companion , as Altman's health was already failing. With an eye towards one of Altman's more intimate films, Blood is distinctly influenced by other great directors. The film opens over a vast desolate landscape, seemingly silent. But Jonny Greenwood's score rises to an almost deafening pitch in a piece inspired by the composer György Ligeti's work. Ligeti is best known for music that appears in Stanley Kubrick's films, 2001: A Space Odyssey , and The Shining . Here we get a sense of what this film will be about, because just as this music is used to evoke a certain alienation of Kubrick's protagonist from the world he finds himself in, Blood's Plainview is also an outsider, a misanthrope. It is his ambition to build an impregnable wall around himself that drives him to seek oil in this wasteland. As the opening sequence continues, Plainview, in a moment of weakness, takes in a boy orphaned by the death of his father, one of Plainview's oil riggers. He names him H.W., and conspiratorially makes him an accomplice in pursuit of his goal. His relationship is where we see him at his most vulnerable. They are led to Little Boston, a poor community, where they were tipped off by Paul Sunday (Paul Dano) that there is oil to be had. Plainview convinces the community to sell him their land, and in return he'll employ the lot of them in helping him fulfill his vision. These scenes are reminiscent of Altman's McCabe and Mrs. Miller . That film's McCabe (Warren Beatty) mysteriously comes to the old mining community of Presbyterian Church where he has dreams of getting rich opening a brothel to serve the miners. Like McCabe, Plainview must appease the community [in the person of Eli Sunday (Dano again), Paul's twin brother] by promising to build a church. In Blood, however, the schism between capitalism and religion is given a much more central focus. Plainview's greed may be a sign of his corruption, but he hardly hides it. He despises the hypocrisy he gleans from Eli Sunday's sermons, and is disgusted by Sunday's attempt to use faith to disguise his own ambitions. A disastrous explosion of an oil derrick comes at a crucial turning point in the story. The effect of the pillar of oil-fueled fire, and Anderson's attempt to confine the film's lighting to the natural light of the blaze, recalls Terrence Malick's Days of Heaven . In that film's key turning point, when sharecroppers try to smoke out locusts that biblically descend on a farm, it also catches fire. Malick chose to use the eerie light of the flames to emphasize the supernatural quality of this moment. Anderson's burning oil derrick spotlights Plainview's naked greed as the flames shoot into the night. As Plainview grows old and achieves his goal of retreat from the human race, he becomes a Howard Hughes-type figure. Hermit-like, he never leaves his mansion, and becomes estranged even from H.W. But curiously, as he descends into this madness, the shots become more formal, and symmetrical. The wide-angle shots in his mansion remind me of Kubrick's depiction of The Shining's Overlook Hotel; vast, isolated, yet allowing us to detachedly observe Jack Torrance (Jack Nicholson) from a safe distance. Anderson successfully stirs the pot with this soup he concocted to come up with one of the most unique and satisfying movies in the last ten years. Run don't walk to get the DVD, out today on single and 2-disc standard DVD. This entry first appeared on Blogcritics on 4/7/2008.